Recovering Working Mom: We've been Boo'd! 1) When you are trying to “Boo” a friend for each child, make sure you know where the baby’s friends live. The only friend I knew where she lived had already been Boo’d, and I didn’t know where anyone else lived. That created some turmoil until the Superego (the oldest) came up with a solution . . .
2) If you bribe the baby to Boo one of her sister’s friends because mommy can’t find the house of the baby’s friends, you’d better be ready to make good on your bribery promise. 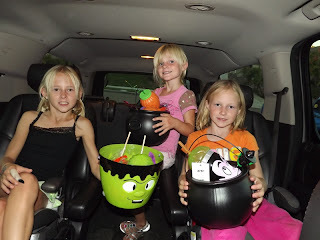 We told the baby that we’d buy her a sucker if she Boo’d one of the Superego’s friends (I was not about to keep a huge basket of Halloween stuff for my kids – it needed a good home). The second the Id dropped off the basket she demanded her prize. So, we gave it to her, and the Superego paid me for it because it was her bribe. I know, mean mommy. In my defense, it was only $1. 3) When you purchase several items for the Boo baskets and you are on the phone while checking out at the store, somehow a few extra items for YOUR children will make their way into the cart. It is not until you see all the wrappers in the car that you realize what the little BOOgers have done. 4) If you ever want to give your husband a small taste of what it's like for you between 2:30 and 6:00 everyday, spend the afternoon "boo'ing" your children's friends and then leave for bunco that evening, letting daddy know that he's on homework duty. Daddy was a little tired by the time I got home. He said, "they're exhausting and they are always moving around and don't do what they're supposed to do." Hmmmm, maybe we'll have this little experiment more often. Recommendation for today – Boo two houses in your neighborhood. Lots of fun ideas can be found at www.organizedchristmas.com. Your kids will have such fun leaving treats for their friends. Hey, we got Boo'd! ;) Super cute.